I am so happy to share this recipe with you today and although it is an easy recipe, it is special to me because the main ingredient of the recipe, potatoes, were grown in my garden and today we dug them out, so the recipe tastied even better. 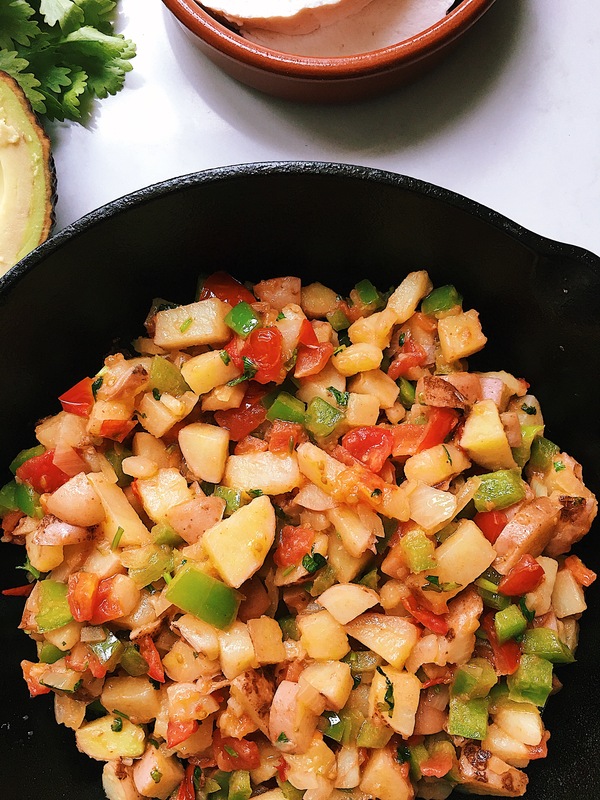 These potatoes are called potatoes garden style, because after been cook in a little bit of oil, you can add the vegetables you like, I like mine with tomatoes, onions, green pepper and coriander (cilantro), other people might like to add other vegetables, so it all depends ok what you like. So here is the quick recipe for these lovely potatoes. Chop all the vegetables and set them aside. Heat a large frying pan and once the oil is hot throw the potatoes carefully. Fry the potatoes for 15 min, stiring them from time to time so they cook evenly all around. To know if the potatoes are cooked, try one and if it is soft that means they are cooked. Once the potatoes are cooked, add the onion, tomatoes, green pepper, coriander, salt & pepper. Cook for further 10 min, making sure to mix the veggies from time to time. Then turn off the heat and serve. That is truly amazing! Felicidades, amiga! Nunca he intentado sembrar papas pero creo que voy a tener que hacerlo el próximo año. Qué rico!